Movie Review: “7 Chinese Brothers”, whose title wrongly suggests a gangster Asian movie or a martial arts adventure, is an insubstantial American indie comedy, containing a few good - if immature - ideas that drive us into a dead end. Jason Schwartzman, habitual presence in Wes Anderson’s comedies and the star in the astute comedy-drama ‘Listen Up Philip’ by Alex Ross Perry, who also appears briefly here as an actor, bestows odd movements, imbecilic facial expressions, and a reckless posture, in a performance that attempts to give shape to his character: Larry, the slacker. Fired from his job for stealing money from the tips jar, Larry, who often embarks in French monologues and nonreversible chats with his equally lazy dog, finds another job in the Quick-Lube garage where he is manipulated by the affronting co-worker, Jimmy (Jimmy Gonzales), and is attracted to his handsome boss, Lupe (Eleanore Pienta). Meanwhile, he keeps visiting his spirited grandma (Olympia Dukakis) at the nursing facility, especially when he’s broke and needs some easy cash. His best friend, Major Norwood (Tunde Adebimpe), is the one who takes care of her. After she dies, it’s with no surprise that her inheritance, of 1.3 million dollars, goes entirely to the likeable Major and not for the opportunist, indolent, and insensible grandson, whom she accused of wanting to patronize her. As the main character, director Bob Byington doesn’t put much effort on his filmmaking style, comprised of realistic but inelegant scenarios with an inclination for dereliction. 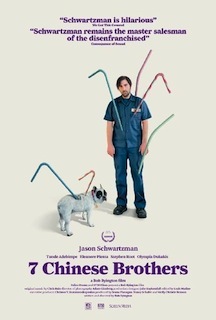 Weird and not so funny, “7 Chinese Brothers” is short in duration (76 min.) but can get you pretty bored, especially if it gets you in one of those days that you’re not in the mood for this kind of pretentious quirkiness. In order to succeed, it relies on the inalterable acting of its cast and a bunch of incongruous situations that are presented with a false feel-good disposition. Sadly, not even the good ideas could be validated by an execution that, on no account, touched harmony. There are much better films about slackers out there that overwhelm Mr. Byington’s forgettable prank.